Back in 2004 I read about plans to develop a new version of Windows code named Long Horn. I also started reading about the new 64 bit CPUs that were starting to appear in prototype form. This told me that it was time to get ready to build a new computer. In 2003 when I was setting up a new system at my girlfriend's house I discovered a new brand of Motherboard. This was Gigabyte. It had everything on board, Ethernet, USB 1.0 and USB 2.0, ATA and SATA interfaces, even the audio too. It had everything except the video. I bought a Video card at Best Buy and slapped in a few drives and some RAM sticks and I was done. 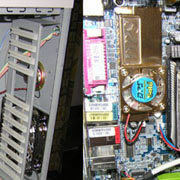 You can see a slide show of the (I build my own Computers) section on this site. So when it came time to start buying parts for my new 64 bit machine I chose the Gigabyte K8NSPXP=939 Motherboard as the basis for my new system. I like having lots of active drives for backup, but I do not like going around them when I have to work on the motherboard. So I found a cube style CPU case that has the room for the motherboard on one side and the drives on the other side. 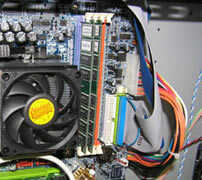 Then I chose the Athlon FX-53 processor. 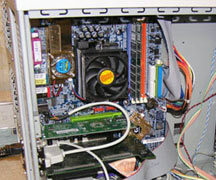 I bought a 600 Watt Power supply, a couple of sticks of DDR ram, a video card from Geeks Dot Com, a few 250 GB drives from J&R Computer World, and put the whole thing together, booted it up and installed Windows XP and by July 2005 I had a PC that was online and ready for Windows Vista.